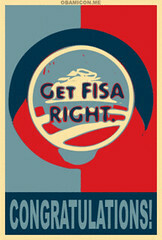 Get FISA right is delighted to announce that our new video/cable TV ad, Congratulations, President Obama. Please get FISA right, premiers January 20, Inauguration Day, on MSNBC, CNN, Fox News, and the Comedy Channel. How cool is that? All the more so because our top-five finish in change.org’s Ideas for Change in America (details TBD, latest update here), which means we’ll get to work with change.org and MySpace Impact to promote it. w00t w00t! Thanks to SaysMe.tv for all their help, to Jason Rosenbaum of The Seminal for a key blog post, and to Get FISA Right members for collaboratively writing the script — and contributing to launch the ad in DC. Get FISA Right members (and anybody else who wants to help): please share the video with your friends. Email the link, blog about it and mention it in comments, post and share on Facebook, change your status (mine currently says “Jon is going to be on MSNBC, CNN, Fox News and Comedy channel tomorrow! http://tinyurl.com/8jpwso.etc”), tweet, etc, etc.. Thanks! If you’d like to congratulate President Obama, please leave a message in a comment either at the bottom of this page — or on Facebook or on YouTube, if you prefer. If you want, you can also share your views with him and the new administration about FISA, the PATRIOT Act, and civil liberties. Please keep it down to a few sentences at the most (and link out to anything longer), and stay positive and on-topic. And if you’d like to congratulate other Get FISA Right members, feel free to do so as well! Draft media release below the fold. PS: If you’d like to help air the ad on cable TV stations in DC and across the country, you can donate on the SaysMe.tv site, or sign up to help with our February money bomb on Facebook (details and other sites coming soon). We’ll be working with change.org and MySpace Impact to promote this, as well as our next video/ad, Innocent Words, Misinterpreted. Stay tuned! Washington DC — Less than a week after being voted one of the top ten “Ideas for Change in America” in change.org’s competition, the Get FISA Right activism movement is launching its new cable TV ad “Congratulations, President Obama. Please get FISA right,” here on Inauguration Day. Even though we disagreed with your position on FISA last July, we worked for your election victory and are excited to be part of the change you’re bringing to Washington. We’re ready to help, and look forward to working with you to restore our Constitution and the rule of law. Congratulations, President Obama. Please … get FISA right. Written collaboratively by about 30 Get FISA Right members in December, the broadcast-quality video was produced by SaysMe.TV, who provides individuals the unique ability to get their ads on the cable networks of choice across the country. Sparked by a post from Jason Rosenbaum on The Seminal, the group easily exceeded its initial goal of raising enough to air the ad on the the three major cable news networks in DC for the inauguration. Plans are still being finalized for the next round of fundraising. For now, a post on Get FISA Right’s blog asks people to contribute via SaysMe.tv’s site and sign up for a moneybomb event on Facebook. 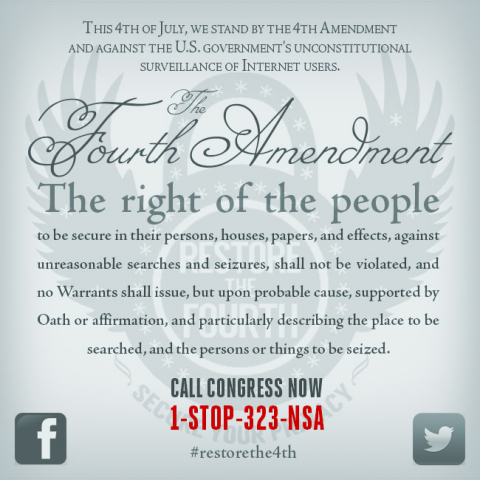 “The Get Fisa Right campaign is an ideal use of SaysMe’s online platform for people-powered politics. The members of Get Fisa Right immediately understood the potential to deepen citizen engagement by offering their supporters the opportunity to place their own personalized TV ads. Now citizens can take advantage of the new administration’s willingness to engage in a dialogue about how to change America,” said Lisa Eisenpresser, CEO of SaysMe.TV. Previous Get FISA Right projects with SaysMe garnered substantial media attention, including posts in Wired’s Threat Level, Ars Technica, the National Journal, Off the Bus, Third Pipe, and a coveted Slashdot link. Promotion of the latest ad will be propelled by new partnerships with change.org and MySpace Impact (a result of the group’s top-ten finish in the Ideas for Change in America competition). WIth new “pooling” functionality from SaysMe.tv that allows supporters to contribute a few dollars to help, rather than having to pay for an entire ad themselves, this campaign is on track to be even more successful. Get FISA Right is a proud group of Obama supporters who believe in his call for hope and a new kind of politics. We ask President-elect Obama and Congress to reject the politics of fear on national security, and work to get FISA right. Please see the About us page on the Get FISA Right wiki, Jon Pincus’ blog post Turning the Page on FISA on change.org, and our blog at https://getfisaright.wordpress.com for recent news. Our Idea for Change in America summarizes our “asks” for the Obama administration in the first 100 days, and was delivered to Obama transition team new media director Macon Philips at the change.org event last Friday. This entry was posted on Monday, January 19th, 2009 at 12:48 pm and is filed under Uncategorized. You can follow any responses to this entry through the RSS 2.0 feed. You can leave a response, or trackback from your own site. Congratulations, President Obama; you overcame unimaginable obstacles,and I truly believe that your victory is the turning point. A change is coming, and you catalyzed it. As for FISA, telecom immunity, and the PATRIOT Act, you’re a constitutional lawyer, and I know understand the importance of civil liberties. Please take the time to get other perspectives on FISA and the PATRIOT Act, not just law enforcement’s and telecom companies. Any political capital you spend here will be repaid a hundred-fold, by reenergized supporters … and by Ron Paul supporters and other libertarians and civil-liberties-loving conservatives, scorned within the Republican party, and vibrantly eager to restore the Constitution and rule of law. And I’d like to add my congratulations to Get FISA Right supporters and allies old and new for helping to make this happen. It was only a few short weeks ago when Ari Melber accurately noted in The Nation “About thirty members are organizing a new push for the inauguration, but they have not regained traction with many supporters, blogs or the press.” Since then we’ve gotten hundreds of people involved in helping us win on change.org, and we’ve gotten mentioned in The Seminal, Democrats.com, DreamActivist.org, Citizen Orange, Emergent Chaos, Sideshow, techPresident, and more. So congratulations to everybody who helped out here, and thanks once again! PS: Just a reminder, I’m going to be mostly offline for the next 10 days. Just saw your appearance on WTTW’s release of the (soon-to-be-famous) 2001 “Check Please”! Thanks for the tip on Dixie Kitchen. Also saw the Dr. Martin Luther King memorial. Thank you for who you are, thus far. Of course laurels are something you will not be given upon which to rest. Not anymore. Please, please: while doing what you can to lead us out of this neoliberal economic crisis—please follow Dr. King’s heart and show the same leadership in voting against the most un-constitutional of amendments: FISA. Yes, FISA. It was perhaps the first of the long chain of assaults on our First and Fifth Amendments. Like a ratchet: Patriot I and II have been a distraction from the original assault on American liberty and the Fourth Amendment. Please get to the root cause of the erosion of our liberty and bring a vote against FISA (and its ill-conceived spawn). Hey guys… Since we “lost” on the issue last summer, I’ve not put an awful lot of time into this because I haven’t been convinced this is “winnable”. But this, and all the other work you folks have been doing… well, it’s simply remarkable. And I want to say thanks. Because if there is any permutation of events that may conspire to reverse the course that’s been taken, y’all will find it. Great work. And thanks again. Congratulations President Obama and thank you for the inspiring speech. I whole heartedly support you and look forward to helping you restore our economy and nation. Please get FISA right. I am a life-long Republican and spent 19 years in the Army, sixteen as an Officer, defending the Constitutional rights of ALL Americans. Many of my fellow servicepeople have given their lives in pursuit of the same. I not only voted for you, but actively campaigned and contributed. Why? Because I did not like the course this country had taken in the past eight years in taking away our Constitutional freedoms in the name of “security”. Like you did today and in the same words Vice President Biden used, I too, took an oath to support and defend the Constitution of the United States against all enemies, foreign or domestic twenty nine years ago. In order to restore the respect of our Nation to the world, we must first restore the Constitutional Liberties to our own Citizens that have been infringed upon and taken away by our own government. Please, Mr. President, do not squander away the mandate that you have been given by the Citizens of this nation, many who crossed “party lines” to do so, to restore our Nation to greatness. Restore our Constitutional Liberties. If the constitution means anything to native americans, it is that there was something greater than us. when you allow a criminal enterprise to hijack the basic tenets of that document, you put one more government promise on the sideline, and this time it effects everybody. we want our country back, sure, but we’ll take citizenship in the greatest democracy that there has ever been, if you don’t forget that we have a democracy after indigenous populations were forced to give up everything. Congratulations! May your presidency usher in 8 new years of real change in America. I am optimistic that your background in constitutional law will inform your policies in the White House and that you will help restore our civil liberties. It was with great joy that I watched your inauguration as the 44th President of the United States. President Obama, please Get FISA Right. I’m old enough to have been on one of the buses to the first March on Washington and to have stood in that great crowd to hear Martin Luther King deliver his speech. Your inauguration crowd was bigger and you’ve got a bigger job. He cleared some of the brush, but he would have fought for every chip taken out of the Constitution for which you swore to protect. Now get Fisa Right. We who voted for change want a roll back of the years since e 9/11 and “The War on Terrorism” which became a war on the Constitution. WE can not be leaders and make torture a national policy. American ideals must be reflected in even handed dealing with Israel and the Palestinians. Good luck and God bless. Congratulations, President Obama. I look forward to your years in office and do hope you work to restore our civil liberties, including revisiting FISA… and getting it right. Congratulations, President Obama! Your inaugural speech was inspiring, including your reference to the preeminence of our founding documents, your acknowledgement that we do not need to choose between security and civil liberties, and your inclusion of nonbelievers along with those who subscribe to many religious faiths (something to which this particular nonbeliever has become ever more sensitive in the recent days of “faith-based initiatives” and government partnerships with religious groups). I am so pleased that you halted the military commission Guantánamo trials on your first day. I look forward to your revisiting FISA to restore constraints on those who would violate the Constitution for whatever reason. “Unless there are compelling reasons, I don’t think we would reverse course,” Holder added. Does warrantless wiretapping of thousands of American citizens, specifically targeting journalists, and merging with credit card information rise to the level of “compelling”? True, these allegations haven’t yet been validated … our “ask” on immunity is for Obama to request a stay until after the Inspectors’ General report in July to allow the Justice Department to make a more informed decision. If this story has legs, and especially if other whistleblowers also come forward to join Tice and Tamm, at some point it may turn out to be “compelling” to Holder and Obama. And hopefully, that’s where we can help. I love the graphic; hadn’t seen it before. Has the Inspector General’s report, which Jon Pincus mentioned on January 23 (it was then due in July), come out yet? The wetpaint site has not been sending me updates, so I’ve sort of lost touch–I’ll regret that when we lose the last shreds of our civil liberties. What are the group’s current actions? I discovered your web site when I was looking for something unrelated, but this post was one of the first sites listed in Google, your blog must be so popular! Continue the good work!